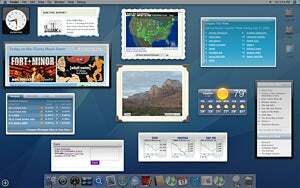 A few days ago, we reported on some rumored OS X Leopard features. Those turned out to be fake as Uncle Tom's toupee. But, the real features unveiled at today's WWDC Keynote turned out to be almost as yummy. If you've missed the presentation, we've gathered everything we could about the new OS—including videos and images—and we vomited it up into this post. Jump to read more. Leopard is Apple's new operating system, due to hit the shelves in the spring of 2007. The OS has been written to fully support 64-bit apps and the Quad Xeon 64-bit chips in the new Mac Pro desktops. And at the same time run older 32-bit apps. All without emulation, which should mean that the new Macs will have software to take advantage of their native architecture. And today, developers at WWDC are walking away with an early version of the OS. If you're lucky, you can find copies in the wild.